Larger Capacity, Greater Reach With Patented New Seed Runner Model 5000 - Unverferth Mfg. Kalida, OH - March 4, 2015- Unverferth Manufacturing Company, Inc. announces the introduction of the model 5000 Seed Runner patented self-filling seed tender for keeping up with today’s larger, faster planters. The new 5000 features a 500-seed-unit capacity along with a two-stage conveyor featuring a low-profile intake coupled with a tubular-loading conveyor for 24-feet of reach and quick, gentle unloading. In addition to the patented self-filling capability, the model 5000 conveyor features 90-inches of vertical height adjustment for easy positioning and exclusive belt designs for gently handling all seed types. The crescent-shaped cleats in the intake conveyor gently lift the seed from the tank to the 10-inch diameter tube with 15-inch belt featuring cupped rows of offset cleats. This combination achieves unloading speeds of up to 45 bushels per minute for quickly returning to planting. 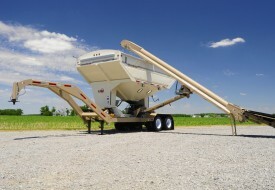 The conveyor design also permits loading directly from underneath a grain trailer with ag hopper. The model 5000 also features a dual-compartment design with large, conveniently placed windows and L.E.D. fill lights for easily determining the seed level whether filling or emptying. The easy-to-operate rollover tarp with 18-ounce canvas keeps contents dry. One-person wireless operation is achieved with a standard seven-function remote that controls the engine and conveyor functions, including the ability to pivot the conveyor into the self-loading position. The LCD scale readout provides load details when the user is at a distance from the optional scale and display. The gooseneck hitch, along with heavy-duty undercarriage featuring tandem axles with spring- ride suspension and dual wheels, provide reliable transport. Four-wheel electric brakes, transport chains, L.E.D. lighting, and clearance lights, provide safer road travel. Additional features include the trademarked ivory and tan finish with silicone-sealed seams for a long-lasting finish. All hydraulic operation is powered by a reliable, electric-start Honda engine producing 690 cc (27 gross H.P.) for optimum performance. The conveyor is powered by the hydraulic 6-cubic- inch, top-mounted motor to keep the belt tight for smooth operation. Electronic conveyor engagement delivers gentle starts and quickly accelerates to optimum operating speed for enhanced belt performance. Productivity options include a T&G applicator for easily and accurately metering seed lubrication products onto the seed for greater planter performance, spare wheel and tire for transport security and choice of scale packages. Convenience options include electric-operated tarp and electric-over-hydraulic-operated jack. For additional information, please see your Unverferth dealer or visit umequip.com.